AGAT, Guam (NNS) -- Sailors assigned to the Arleigh Burke-class guided-missile destroyer USS Preble (DDG 88) participated in a community relations project at Marcial A. Sablan Elementary School in Agat, Guam, Nov.1. During the volunteer event, Sailors spent the morning interacting with students, reading them books and telling them about their roles as Sailors aboard a U.S. Navy warship. "I really appreciate and enjoy it when Sailors come to the classrooms," said MayAnn Charfauros, a teacher at the school. "It's a great opportunity for the children to be exposed to something outside of our island community, and hopefully it inspires them to have successful careers in the future and to open their minds to all the possibilities that are out there for them." The students weren't the only ones who benefited from the visit; the Sailors also found it rewarding to give back to the community. "I've never been to Guam before and it was interesting seeing the culture and different aspects of their life," said Interior Communications Electrician 3rd Class Requann A. Goins. "Seeing their faces light up when we talked about ourselves was rewarding to see." The day also reminded Preble's Sailors of their own upbringing. "It was a lot of fun interacting with them and it brought back childhood memories," said Goins. "Even though I grew up in Virginia- thousands of miles away- just sitting in the small chairs, playing on the jungle gym and sliding down the slide with them made me feel connected to them." 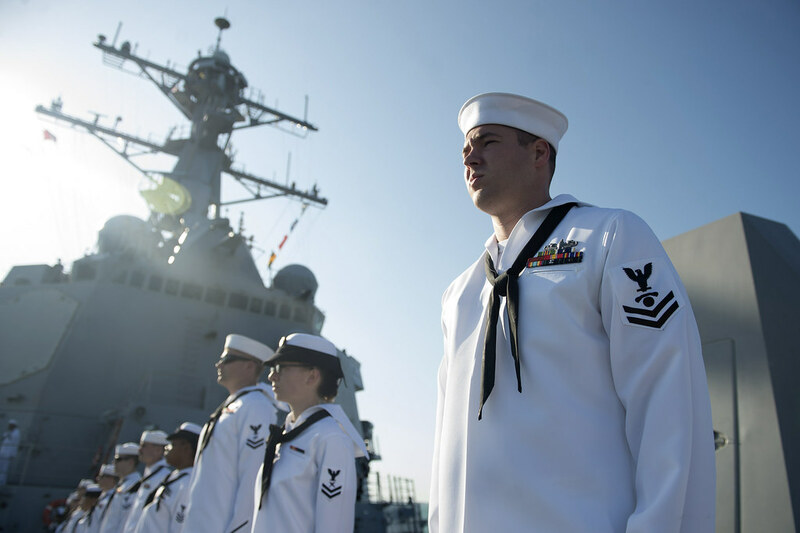 Preble is currently deployed to the U.S. 7th Fleet area of operations with the aircraft carrier USS Theodore Roosevelt, the flagship of CSG 9, along with the guided-missile cruiser USS Bunker Hill (CG 52), and guided-missile destroyers USS Halsey (DDG 97) and USS Sampson (DDG 102). The Theodore Roosevelt Carrier Strike Group (TRCSG) deployment is an example of the U.S. Navy's routine presence in waters around the globe, displaying commitment to stability, regional cooperation and economic prosperity for all nations. Preble departed Joint Base Pearl Harbor-Hickam for a regularly scheduled deployment, Oct. 16, to the U.S. 7th and 5th Fleet areas of operation in support of maritime security operations and theater security cooperation efforts. For more information, visit www.navy.mil, www.facebook.com/usnavy, or href='http://www.twitter.com/usnavy'>www.twitter.com/usnavy.